The Spanish court which has been receiving evidence about the 1989 murders of six Jesuit priests, their housekeeper and her daughter, issued an indictment today for 20 former officers in the Salvadoran military. The court in Spain is acting under a doctrine of "universal jurisdiction" in which some crimes against humanity are so serious that they can be prosecuted anywhere. The case against senior officals, including two ministers of defense, had never been brought in El Salvador because of the 1993 amnesty law. In an indictment issued Monday, Judge Eloy Velasco Nunez accused the officials -- including El Salvador's former defense minister -- of murder, terrorism and crimes against humanity. He said a trial in El Salvador was flawed and failed to bring the perpetrators to justice. WikiLeaks has provided some 942 US diplomatic cables related to El Salvador to the online periodical El Faro. The cables cover the time period from 2003 through 2008 under the Bush administration in Washington and the Flores and Saca administrations in El Salvador. El Faro has now started to make those cables available online on its website. The leaked cables provide an inside look at the US-El Salvador relationship, and highlight a US administration which believed it had found a very close ally in the ARENA led governments of those years. I'll highlight some of the individual cables in future posts. The WikiLeaks project represents yet another coup for the independent journalists at El Faro. Other cables from the US Embassy in El Salvador dated in 2009 and 2010 were released several months ago. The FMLN has confirmed that Jorge Schafik Handal will run as the left wing party's candidate for mayor of San Salvador in the 2012 elections. He is the son of Schafik Handal, an FMLN guerrilla leader during the country's civil war and unsuccessful candidate for president of El Salvador in 2004. 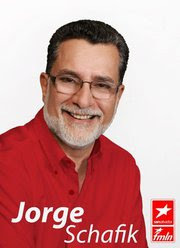 Jorge Schafik Handal is currently a deputy in the National Assembly from Usulutan. He will be running against the current mayor of San Salvador, Norman Quijano from ARENA, who won his first term as mayor in 2009. I have written previously about the growth of aircraft maintenance business at Aeroman in El Salvador. US airlines such as JetBlue, US Airways, Southwest, and others outsource with Aeroman to provide heavy maintenance on jetliners in their fleets. The Aeroman facility at El Salvador's international airport provides hundreds of good-paying (by El Salvador standards) jobs. A week ago, KIRO-TV in Seattle, did an "investigative" report on Aeroman, titling it Third-World Mechanics Paid $2 Per Hour For Boeing, Airbus Jet Repairs. (A year and a half ago there was a similar story on National Public Radio). The ghostly image above is an X-ray image taken by Mexican authorities who discovered 513 migrants stuffed into two tractor trailer trucks in the southern Mexican state of Chiapas last Tuesday. In the X-ray, you can see how some migrants were standing, holding on to ropes so others could fill the floors. More than 400 of the migrants were from Guatemala. Of the others, 47 were from El Salvador. The migrants said they paid $7000 each for the trip. Four of the human smugglers were captured. This case provides another example of the desperation pushing Central American migrants out of their countries towards the north. Despite the well-publicized dangers of the journey, hundreds and thousands try to travel illegally through Mexico and into the US. A report in La Prensa Grafica states that 500,000 undocumented Central American migrants pass through the Mexican state of Chiapas each year. The online periodical El Farohas published a major exposé on a drug-trafficking organization in El Salvador known as the Texis Cartel. These narco-traffickers control a route which transports drugs from the town of San Fernando on the northern border with Honduras in Chalatenango to the border with Guatemala in Santa Ana Department. This route basically cuts across the northwest corner of El Salvador. Mauricio Funes of the FMLN party, has been a disaster for the once-thriving Salvadoran economy.This week's editorial is just part of a string of right-wing diatribes against El Salvador which O'Grady has published over the years. The Denver publication Westword has a cover article this week which shines a light on violence against LGBT persons living in El Salvador. The story, titled Coming Out to America, tells the story of Kassandra, a transgender Salvadoran woman fled to the US, seeking asylum from the violence, prejudice and persecution she faced at home. A 2010 report to the UN titled The Violation of the Rights of Lesbian, Gay, Bisexual and Transgender Persons in El Salvador provides an overview of the situation facing LGBT individuals in the country. The story of Kassandra puts a personal face on that situation. From time to time, I have pointed to the blog of Tim Lohrentz who writes about the indigenous history of El Salvador. Most recently, Tim writes about a death and resurrection story in Maya-Lenca culture -- the story of One Hunahpu who is killed and then resurrected as a calabash squash. As he explains, it is a story with roots in history, agriculture and astronomy. Salvadoran president Mauricio Funes announced today that Salvadoran troops will continue providing support in combating crime in the country for at least another twelve months. The announcement came as part of ceremonies marking the Day of the Salvadoran Soldier. Although the visible presence of troops in the streets has been popular with Salvadorans weary of the country's ongoing crime wave, there is little evidence that the troops have had any significant impact on crimes of extortion and murder. Homicides in 2011 continue at the same rate as in 2010. As previously reported, a deportation trial is being held in Florida, where the US government is seeking to deport General Eugenio Vides Casanova, former head of the Salvadoran National Guard and former Defense Minister. El Salvador's two oldest right wing political parties have lost their official standing following a ruling by the country's Supreme Court. The Christian Democratic Party (PDC for its initials in Spanish) and the National Conciliation Party (PCN) failed to receive then necessary 3% of votes in the 2004 presidential elections which would allow them to continue as recognized political parties. However, in 2005, a law passed by the National Assembly purported to waive the 3% requirement, and allowed the parties to continue to participate in elections. In its ruling this week, the Supreme Court found the 2005 law to be invalid and in contravention of the requirements of the Salvadoran constitution. (There's a good overview of the court ruling in an article in El Faro at this link).